Poker legend Daniel Negreanu has six World Series of Poker titles, two World Poker Tour titles, a beautiful Las Vegas-area home, over $30 million in prize winnings, global recognition, and now his own documentary. Produced by PokerStars, Negreanu’s nickname-titled biographical documentary “KidPoker” premieres nationwide December 1st at 8:30 PM ET on TSN4. Despite all that, there’s still something missing in the 41-year-old native of Toronto’s life. There’s no hockey team. Negreanu grew up as a Maple Leafs fan, and now resides in the Las Vegas area where he has joined lead investors Bill Foley and the Maloof family in an effort to bring an NHL franchise to the strip. While some NHL teams have struggled to make in-roads in some markets in the American South, this group has confidence this market will love hockey. “It will be the first major sports team (in Las Vegas) and if you look historically, any city that’s had just one team, like San Jose for example, they do amazing,” said Negreanu. “There was no hockey culture in San Jose before the Sharks came and now it’s a Shark’s town. Negreanu sees one more advantage that no other team can offer. “People will go to games in Vegas as visitors as a destination game,” said Negreanu. “Nobody says ‘let’s get the buddies together and we’ll go to Columbus and watch the Blue Jackets.’ No one’s going to do that. While Negreanu will not likely have much of an influence on personnel decisions, he trusts Foley’s team and hopes his life experience as a Leafs’ fan can help with building a winner. “As far as overall strategy, I would love to have some say in terms of how things are being done because I think, Toronto for example, is a perfect example of a city that, for 20 years, has been doing it wrong,” said Negreanu. 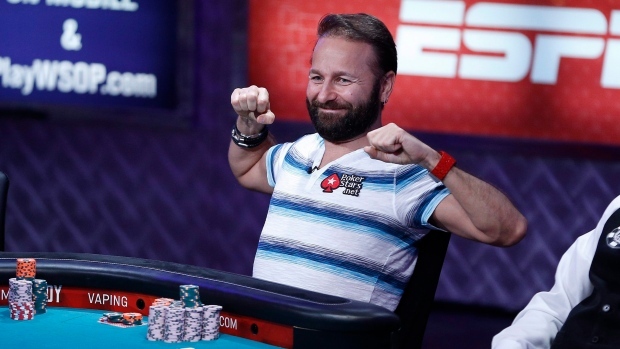 As a high school dropout who won his first World Series of Poker bracelet at the age of 23 and is currently poker’s career leader in prize winnings, Negreanu knows a thing or two about achieving greatness. “Mediocrity means you just stay mediocre forever,” said Negreanu. “If you look at the great teams today, Chicago, the Kings, they were awful and then they got four or five key draft picks, just like Pittsburgh did before, and they built a team around that. Negreanu has no problem voicing his opinions. He recalls sharing his thoughts on a particularly lopsided Leafs’ move with the Leaf himself. While Negreanu may soon have a new favourite team, he’s pleased with the latest direction of his hometown club. The son of Romanian immigrants describes himself as having a “hockey pedigree” and a team in Las Vegas isn’t the only NHL innovation that Negreanu is a fan of as he is eagerly anticipating the 3-on-3 tournament format of the upcoming NHL All-Star game in Nashville. Some fans and players have complained about the NHL’s new three-on-three hockey format, but Negreanu has a message for that crowd. Negreanu realizes that the NHL has a lot of room to grow in non-traditional markets and thinks the new open-ice format will bring in the “casual fan”. Negreanu has been credited with transcending televised poker’s popularity with his outgoing personality, trademark table chatter, and ability to guess opponents’ cards. As he prepares for his life story to be told on screen, one of the most recognizable man in Vegas hopes to help transcend a new market of fans to a new NHL.